Joey grew up in Fairmont and then Buckhannon, West Virginia. He attended Warren Wilson College, where he studied Philosophy and worked for the Carpentry Crew. He continued his studies at The University of Montana, in Missoula, and the University of North Texas, in Denton. He has mostly focused on Environmental thought. In 2010-11, he was an AmeriCorps volunteer for the Appalachian Forest Heritage Area, where he mostly engaged in the restoration of wood windows, wood siding, and plaster walls in historic structures. He lives in Charleston, WV. 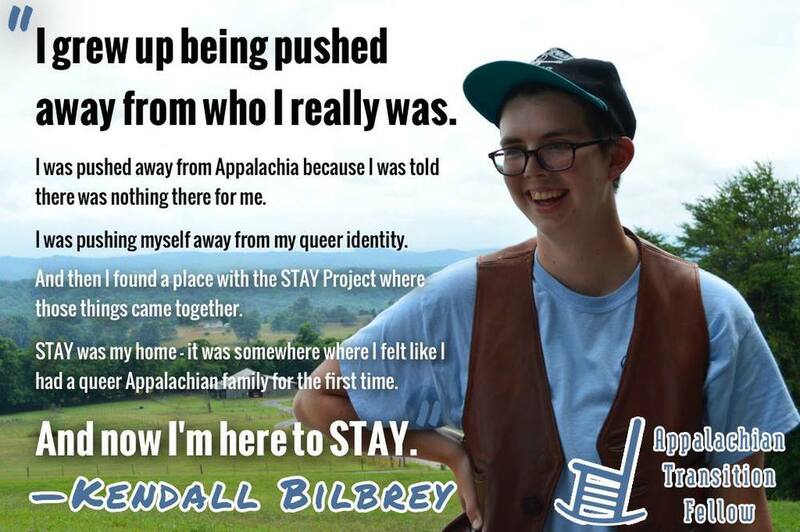 Growing up in the Blue Ridge Mountains of Wytheville, Virginia, Kendall has made it a priority to protect Central Appalachia and its people. Kendall is a 2012 graduate of George Mason University with a Bachelor of Science in Conservation Studies. Upon graduating from college, Kendall embarked on a journey to China where they studied red panda and giant panda behavior for the Smithsonian Conservation Biology Institute. Kendall is passionate about the Central Appalachian region and working towards a just economic transition in the region. Kendall also hopes to promote the sustainability and conservation of the rich biodiversity and culture of the region through their work. Outside of their work in conservation, Kendall enjoys Old Time Mountain music and connecting with people everywhere they go. Since 2011, Tyler has been active as a student and citizen of West Virginia's coalfields in demanding economic and social shifts that create the space for a free, autonomous Appalachia. Tyler has worked on disaster relief efforts since Freedom Industries' chemical spill into the Elk River in January, and is working on creating networks amongst communities to develop more resiliency in the face of disasters that will become more common with the advancement of extractive industries. His focus is on creation as a form of resistance, in order to create a more humane existence for his family and others who are money-poor, as well as to help create the infrastructure of a just future. Born in Columbus, raised in South-Eastern Ohio and educated in Kentucky, Paris, Greece, and Ireland, Carol Davey has been living the last decade out of suitcases while she discovers herself and how to be a benefit to the world. Carol graduated from River Valley High School in Cheshire, Ohio 2006. She immediately began her undergraduate work at Berea College, where she was enrolled on an academic scholarship. Throughout the four years at Berea, Carol worked on various organizations, committees, and campus employment- including acting as a manager in the College Public Relations department, and for a Fair Trade non-profit. She graduated in 2010 majoring in Communications and Peace and Social Justice Studies, with a Political Philosophy cherry on top. Following graduation Carol spent time working for her family’s small business and AmeriCorps before she left the US for a Master’s Degree in International Peace Studies at Trinity College in Dublin, Ireland. Her thesis (2014) on the Olympics as a soft actor in US/Russia diplomatic relations from the Cold War to present is a culmination of her favorite academic areas. Throughout this fellowship and beyond Carol hopes to meld her passions of politics, peace, media studies, and intercultural communication to bring the lessons learned from the World back to be utilized by her home communities. Born and raised on a tobacco farm until the age of eight, Eric L. Dixon has lived his entire life in “Rocky Top” Knoxville, Tennessee. He is driven by a personal philosophy to live deliberately and a passion for the cooperative pursuit of social and economic justice. A lifelong Appalachian, Eric is fervent about the history and committed to the future of the enchanted mountains he calls home. Eric spends much of his free time on a ridge or in a creek, and has explored over 300 miles of trails in the Great Smoky Mountains alone. Adam grew up in southern West Virginia. He served in the United States Army as a food preparation specialist, an Americorps arts/culture VISTA, and for the last 2 years has worked as a logistics coordinator for a multitude of civic and environmental groups. Adam is deeply committed to West Virginia and strongly believes that responsible and innovative agriculture is the best course of action to meet the increasing demand for jobs in his home state. In his off time, Adam loves to take long fishing trips "away from it all". Mae was raised in rural Rockbridge County, Virginia between a cow field and a cornfield. She left the area to attend Tufts University in Boston. There, she focused her Anthropology major on studies in food and farming, doing her fieldwork on Boston-area farms. After writing her thesis exploring the meaning of “local” in “local foods,” she graduated in the spring of 2013 and returned to Virginia. Continuing to focus on food and farming issues, Mae has done work on a farm and at a flour mill, as well as volunteered with the Virginia Association for Biological Farming. She is excited to bring her passions and experiences to eastern Kentucky with the Community Farm Alliance and the Foundation for Appalachian Kentucky. Willa is from McRoberts, KY. She has worked as a youth media producer and community organizer over the past several years. She is completing her studies in radio/tv/film and Appalachian Studies at East Tennessee State University and is excited to use her experience in her upcoming role as an Appalachian Transition Fellow. Catherine is a writer and multimedia producer from Fayette County, WV, where she is self-employed at Beauty Mountain Studio (beautymountainstudio.com). She has worked as a newspaper reporter, radio producer, editor, archivist, college instructor, and galley cook and currently serves on the boards of several volunteer organizations, including DuBois on Main, the West Virginia Mine Wars Museum, the Paint Creek Scenic Trails Association, and the Journal of Appalachian Studies, where she edits the media review section. Her interests include poetry, people's history, media representations of Appalachia, environmental stewardship, and narrative storytelling. She holds an MFA in creative writing from the University of Montana and a BA from Harvard University, where she wrote a thesis in comparative literature and a thesis in creative writing. Joshua was born in Birmingham, Alabama. He is the youngest son of three children. Being of a working class family, Joshua always dreamed of working as an agent of change, correcting injustice and improving the quality of life for humanity. He became a graduate of Berea community High School in 2004 and was awarded the Minority Leadership Scholarship; and shortly after, moved with his sister to Knoxville, Tennessee. In 2009 Joshua, became a cofounder of Socially Equal Energy Efficient Development (SEEED). Soon after he received the Community Shares Seed of Change award in 2011. Aside from being an activist and fighter for change, Joshua Outsey is a brilliant artist. He writes poetry, and is a talented stage performer. He has written hip hop songs with positive messages like, “Rap School” and “Time for a Change”. Both of these songs are inspirational, and are a reflection of his own life. Zach Swick is a social scientist and wannabe-mountain man invested in the future of Appalachia. His work focuses on social-ecological systems and rural economic and community development—particularly the intersections of natural resources, public policy, and management. Zach first came to the region through serving in AmeriCorps in West Virginia where he worked with the nonprofit Appalachian Forest Heritage Area. There he concentrated on issues of heritage tourism, environmental conservation, and historic preservation. More recently, Zach won the 2014 Appalachian Studies Association's Carl A. Ross Student Paper Award and was inducted into the prestigious Cratis D. Williams Society. He received a B.A. in anthropology from the University of New Hampshire and a master's degree in Appalachian studies, sustainable development, and geographic information science from Appalachian State University. Zach is excited to have been placed along the Hocking River and looks forward to catalyzing economic change in southeast Ohio. In his free time he likes to hike, ski, practice yoga, and watch bad 90's action movies. Tom lives in Knoxville, TN and works primarily on strip mining issues. He has spent the past three years supporting community organizing efforts and direct action campaigns with groups such as Hands Off Appalachia, Mountain Justice, and the Clearfork Community Institute. He has also been involved with the Black Belt community of Gee's Bend, Alabama since 2011. There, he supports community economic development projects focused on heritage tourism. Tom spent the first twenty three years of his life in the hills of Northeast Georgia at the foot of the Blue Ridge Mountains and enjoys biking, reading, and weekends. Derrick Von Kundra was born in California but grew up in Northern Virginia and Central Pennsylvania. After graduating from Kutztown University with a degree in marketing, he went to work in the merchandising department for Ahold USA, the parent company for Giant Foods and Stop & Shop for almost four years. One of his roles involved working with small, local vendors, who were just starting up. It grew into a passion of his and he recently moved to Southwest Virginia to work with Appalachian Sustainable Development. Derrick is looking forward to continuing his work with local foods and tackling the logistical issues of distribution for the region.